You're The Cherry On Top! Doesn't it look good enough to eat?!! (I think I might be just a little bit carb and sweet deprived!). I stamped Karen Lockhart's Doodles Ice Cream Cone with Memento Tuxedo Black ink onto Copic X-Press It Blending Card. I like using this cardstock to watercolor with my Copics because it's so smooth and the colors push around and blend easily. I used BG000-Pale Aqua for the background. You can probably see how wet the edges of the aqua background are below -- You can use just the Blender Solution in the waterbrush to blend and fade out the edges of the color right into oblivion! Thanks so much for visiting . . . I hope you have a fabulous weekend ahead! I'll be back Sunday evening with a fun StampTV Challenge for you! HRR Birthday Celebration Blog Hop! Today is a very special birthday for a dear friend -- Julie Ebersole! As an ode to the Queen of CAS -- this is about as clean and simple as I get! Julie, I hope you have the most fabulous, best year of your life yet! Big birthday hugs to the PNW from Texas! True story -- When Julie and I first met in person in the fall of 2006, we were gathering with some mutual stamping friends for an event and I brought my Copic markers because everyone wanted to learn how to color with them, since they were so new to the papercrafting community. But I hadn't been very successful in working with them yet (back then there weren't any video tutorials about them yet, or Copic Certification classes) and I tried to show everyone how to color with them but Julie had to jump in and rescue me! Thanks, Julie -- I think I finally got the hang of them . . . Your next stop on Julie's birthday bash blog hop is Shari Carroll. 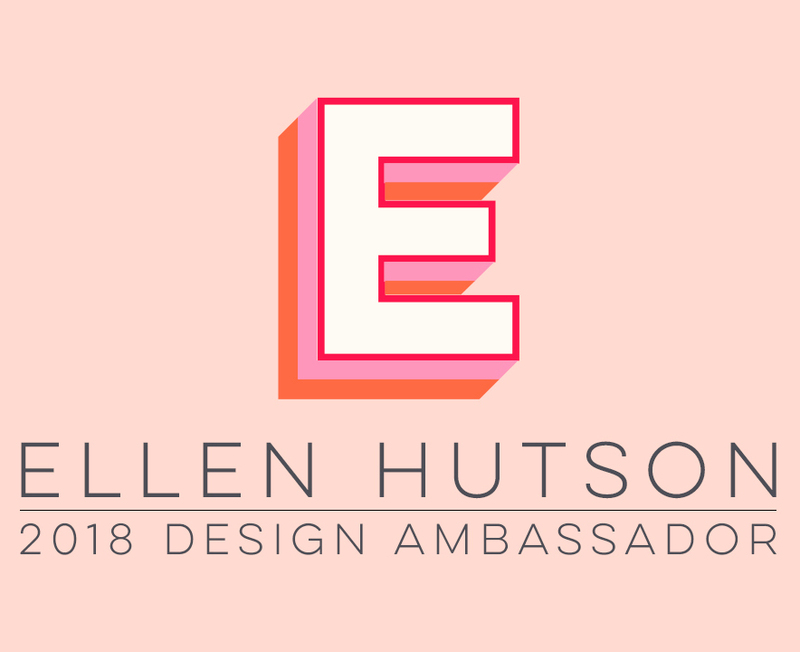 If you get lost along the way or experience a broken link, you can find the full list of blog hoppers over at Ellen Hutson's the CLASSroom. It's almost that time . . . can you believe the first month of the year is almost over? February is just around the corner, so I got a head start on my February calendar! I hope you'll join me over in Ellen Hutson's the CLASSroom, where I'll show you exactly how I created my calendar. Happy weekend!
. . . a great balancing act -- isn't that the truth?!! Today was the 9th straight day I've been working of a 12-day stretch, so I decided I needed a little break tonight. Some coloring therapy was exactly what I needed and this Balanced Diva by Debbie Corbari for Gina K Designs stamp set came to the resuce! Skin: E00, E11. Lips: R20. Hair: YR31, E31, E23. Tank: BG53, BG72. Pants: T6, T8. Floor: T0, T1. Then I finished it by highlighting the molding with dark teal blue metallic rub-on paste. With this framed art sitting on my work desk, I think I just might be able to make it another 3 days this week! The Design Team for Gina K. Designs welcomes you back to Day 3 of our January release inspiration blog hops … Gina and the Design Team will inspire you with many beautiful ideas! And as you hop through the blogs listed below, make sure to leave a comment on each of them because we will choose a few random comments and those stampers will each win a grab bag of Gina K. Designs products! To see the full list of winners check the Big News forum at Stamp TV a few days after the hops. I stamped the birds with Memento Gray Flannel ink onto the coordinating Sweet Tweets Silhouette cut file, to match the softer blacks in the Crate Fourteen paper I used. Then I color it with these Copic markers: BG53, R81, R83, YR01, YR02. Gina's Color Companions Ocean Mist wide grosgrain ribbon and Innocent Pink button were perfect matches to the paper. And last, but not least, in our January new stamp sets is a brand new sweet line of Darling Divas Mini Sets by Debbie Corbari, our newest illustrator to join Gina K Designs … welcome, Debbie! Her skirt and jacket cuffs are glittered with Star Dust Stickles and she is popped up on foam tape over her figure eight hearts, which were stamped with white chalk ink. I love that cute sentiment! It was stamped with Jet Black Archival ink. I used last week’s Free Shape of the Week, Love You Card, from the Silhouette Online Store for my card base. It was cut from Gina’s Bubblegum Pink Heavy Base Weight Cardstock, backed with Innocent Pink, and Black Onyx accents. I can’t wait to share some more Diva inspiration with you later this month! Thanks so much for joining the Gina K design team for our inspiration hops this week –- I sure have enjoyed reading all of your fabulously kind comments the past two days . . . thanks so much for leaving them! Be sure to check out the wonderful inspiration the rest of the team has to show you today and leave comments for your chance to win the grab bags! Sharon Harnist <= You are here! The Gina K Design Team welcomes you back to Day 2 of our January release inspiration blog hops … Gina and the Design Team will inspire you with many beautiful ideas! And as you hop through the blogs listed below, make sure to leave a comment on each of them because we will choose a few random comments and those stampers will each win a grab bag of Gina K. Designs products! To see the full list of winners check the Big News forum at Stamp TV a few days after the hops. Gina’s new Color Companions Red Hot Double Stitched Ribbon (narrow) is tied through the cut out heart opening at the bottom of the box. The finished size is a little over 6" tall x 3.50" wide. Our next featured set today is Spoon Me by Becky Oehlers – I love all the cute punny sayings and images in this set and the endless possibilities of combinations you can get from it! I stamped the glasses with Gina’s new Red Hot Color Companions ink onto White Heavy Base Weight Cardstock that had been cut with Becky’s Spoon Me Silhouette cut file. Then I cut out the centers of the glasses and placed vellum on the back, to create lenses! Those cut little hearts are from Becky’s set, too! The sentiment was stamped onto Becky’s Silhouette cut with Jet Black Archival ink and popped up on foam tape. I stamped the darling LOVE sentiment and double heart with Gina’s new Color Companions Cherry Red ink, onto White Heavy Base Weight Cardstock, then used the larger solid heart stamp to stamp the insides of the hearts with Innocent Pink ink. A 1-3/4” circle punch was used to cut out the double heart, which is covered in Star Dust Stickles and popped up on foam tape over the white paper heart doily. Gina’s new Color Companions wide Red Hot Double Stitched Ribbon ties everything together. Be sure to leave comments on all of the blogs below, for your chance to win the Gina K grab bags! See you back here tomorrow for another day of Gina K inspiration! The Design Team for Gina K Designs welcomes you to another fabulous Inspiration Blog Hop … Gina and the Design Team will inspire you with many beautiful ideas! And as you hop through the blogs listed below, make sure to leave a comment on each of them because we will choose a few random comments and those stampers will each win a grab bag of Gina K Designs products! To see the full list of winners check the Big News forum at Stamp TV a few days after the hops. The card base uses these cut files from the Silhouette online store: Card-Heart Square Invite by Samantha Walker, cut from Gina K Kraft cardstock, and 4 Scalloped Shapes by Lori Whitlock (scalloped rectangle the rose was stamped on), cut from Gina’s Ivory Layering Weight Cardstock. I stamped the sentiment and rose with Memento Tuxedo Black ink and colored the rose with these Copic markers: R20, R24, R29, G21, G28, W1. A pretty bow tied with Gina’s new Cherry wide grosgrain ribbon (LOVE this color) finishes it off. The white background uses the Hearts and Bird Cutout Card by Alaa’ Studio cut file from the Silhouette online store, cut from Gina’s Heavy Base Weight White Cardstock –- it was popped up on foam tape over a 4.25” Red Hot card base. I used a Quilt Card cut file by Lori Whitlock from the Silhouette online store to cut all the quilt "squares", but you could do them yourself by just punching circles and scoring them with a square, then folding inwards on the score lines. The sentiment was stamped with Gina's Red Hot and Jet Black Archival inks on Kraft cardstock. The pretty scalloped line Carolyn included in this set was also stamped in black ink to anchor the quilt squares. Thanks so much for joining us today . . . be sure to leave comments on all of the blogs below, for your chance to win the Gina K grab bags! Sharon Harnist <== You are here! Be sure to check out my blog post below, for detailed information about all of the new January Gina K Designs products! Gina K January Release Night! The Gina K design team will be showing you samples with all the new January 2013 stamp sets that were released last Thursday night at our Release Party, with inspiration blog hops starting tomorrow through Wednesday! Until then, I wanted to give you a few more details about some of the products I mentioned below in my Color Companions blog post. The whole line will be called Gina K. Designs "Color Companions". Each Color Companions collection includes the ink pad, refill, buttons, ribbons and cardstock. All items are sold separately. Gina is also offering a Color Companions cardstock collection that includes 3 sheets each of all eight Companion Colors so you can have a taste of the entire line! 2. Ribbons - Different styles to keep your projects fresh and exciting. Each package includes 3 yards each of both 3/8" and 5/8' widths of grosgrain, organza, double-stitched and gingham, in colors that coordinate with the above collection colors. Gina K. Designs and StampTV was created as a place for creativity and friendship. Many seek out our site to find new ideas and to spend time with crafting companions so that word means a lot to us as we see our customers as our friends. Some Color Companions match perfectly, others complement each other, just like our friendships at Gina K. Designs and StampTV. We will continue to offer new colors throughout the year, so stay tuned for more beautiful Color Companions and other companion products! I look forward to sharing many of these new products in my samples on the inspiration blog hops that start tomorrow . . . see you then! I hope you'll join me there and maybe give it a try this weekend! Gina K Designs wants to invite you to our January product release party tonight! The fun all starts tonight on the home page of StampTV.com from 7-9 PM central time. Other Color Companions collections include: Fresh Asparagus, Ocean Mist, Red Hot, Dark Sage, Honey Mustard and Innocent Pink . . . swoon! I used one of the flourish stamps from this set to accent the lower right and upper left corners. The flower was made with Spellbinders Peony dies, cut out of red wool felt. The pretty sentiment was stamped with Versamark and white embossed onto black cardstock, then die cut with a Spellbinders Fancy Tags die. I started by die cutting black cardstock and then stamped the images with Versamark and white heat embossed them. Then I lightly rubbed white chalk ink onto the die cut's embossed edges and a few other smudges here and there. Then I used a white pencil to draw the lines around the flourish at the bottom and the diagonal accent lines. The stamped oval image was die cut with Spellbinders Classic Oval die and popped up on Copic Foam Tape to give it more dimension and interest. Thanks for stopping by, I'll be back tomorrow with another new JustRite January preview! Going with the colors in the vintage paper, I stamped the pretty filigree label with Memento Rhubarb Stalk ink and the sentiment with Memento Sweet Plum. After die cutting the label with JustRite's custom matching die, I outlined the interior of the frame with Copic E42 and colored some of the scroll work with it, too. Latte pearls accent the frame. The frame was sponged with Memento Toffee Crunch ink and popped up on Copic Foam Tape. The vintage paper was trimmed to fit the red card base, which was die cut with Spellbinders Resplendent Rectangles. Lavender seam binding was tied using the Bow Easy (both from Sharon Johnson's Stamp Simply Ribbon Store). Valentine Tag & Season's Givings Winner! Once again, the smaller nibs on these Sketch markers made it easy to color the smaller details of this image. I also colored a piece of white lace trim with the BV13 marker, so it would match the image. The heart was fussy cut and then mounted with Copic Foam Tape to a red tag left over from my 2012 Advent Calendar project (it measures 2.75" x 4.25" and was cut with a free tag file that came with my Silhouette Cameo). I attached a tiny 7 Gypsies metal key to the heart (I colored it black with Copic 100 marker), also using the Copic Foam Tape -- I love that I can cut just the size I need of this tape, to fit my project perfectly! The ribbon was secured to the bottom of the tag with Tim's Tiny Attacher and the sentiment stamped with a fun roller date stamper. Machine stitching around the perimeter and tied ribbon at the top complete this Valentine tag. Bundled up in a warm blanket by the fire! Thanks for the chance to win something. Congratulations, Renee! Please send me your mailing address by using my email link under my photo above, and I'll get your prize package right out to you! Thanks for stopping by today ... happy weekend! So excited for the new class to come to my area! Congratulations, Athina! Please send me your mailing address and Copic will send out your goodies to you! I'll be back later this afternoon with some cute new artwork by Lockhart Stamp Company and to announce the winner of my Season's Givings giveaway. Happy Friday!